The ImLal biorich project evolved from the revegetation design book Recreating the Country, published by em PRESS for Ballarat Region Treegrowers in 2009. The book arose out of a 'Boosting Biodiversity' workshop held by BRT. While integrating conservation and production has become the catchcry from foresters to dairy farmers, we wanted to examine what can be practically done. At the heart of Recreating the Country are ten design principles, observed from nature, which set out to bridge the gap between farm forestry and environmental plantings and bring back the bush in rural landscapes. 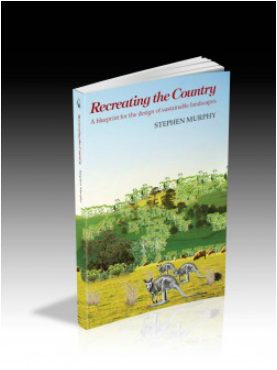 Author Stephen Murphy asserts we have to rethink our revegetation strategies to match the sophistication of natural design principles. Recreating the Country challenges landholders and land managers to consider new ways of thinking about how we might reverse the inexorable decline and disappearance of Australian plants and animals from rural landscapes. This book provides the ‘stretch goals’ and the blueprint for ways of adding habitat and designing more ‘wildlife-friendly’ properties. It introduces the model for a new form of revegetation – the ‘biorich plantation.’ Integrated with farm forestry, the biorich plantation would aim to enrich habitat potential across rural landscapes, not just for a lifetime, but in perpetuity. Author and ecologist Stephen Murphy has, with his wife Lina, run a successful native plants nursery in central Victoria for over 25 years. He is qualified in the fields of geology and natural resource management. He puts a significant amount of time into local conservation work, being an active and founding member of four committees that continue to manage and protect local reserves. He has also been an active member of his local Landcare group for over a decade. 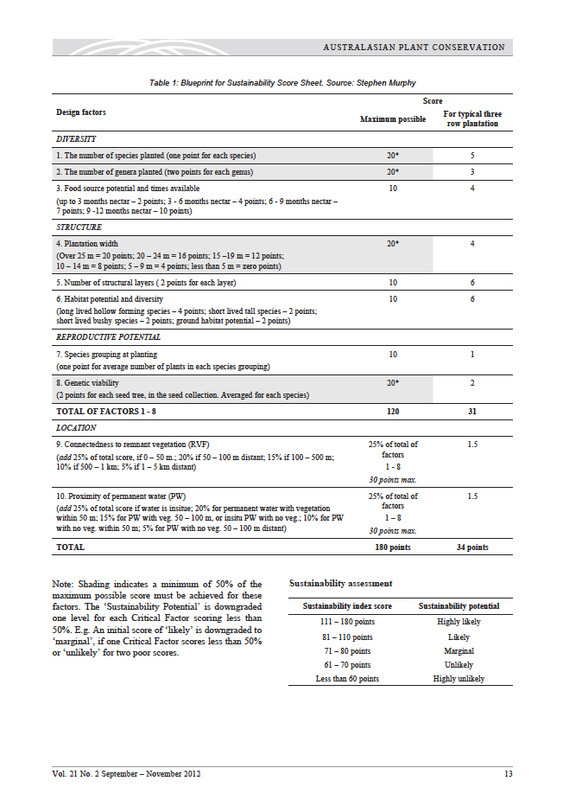 The Blueprint found in Recreating the Country for scoring the sustainability potential of a revegetation is reproduced as it appears on pp. 62-63. 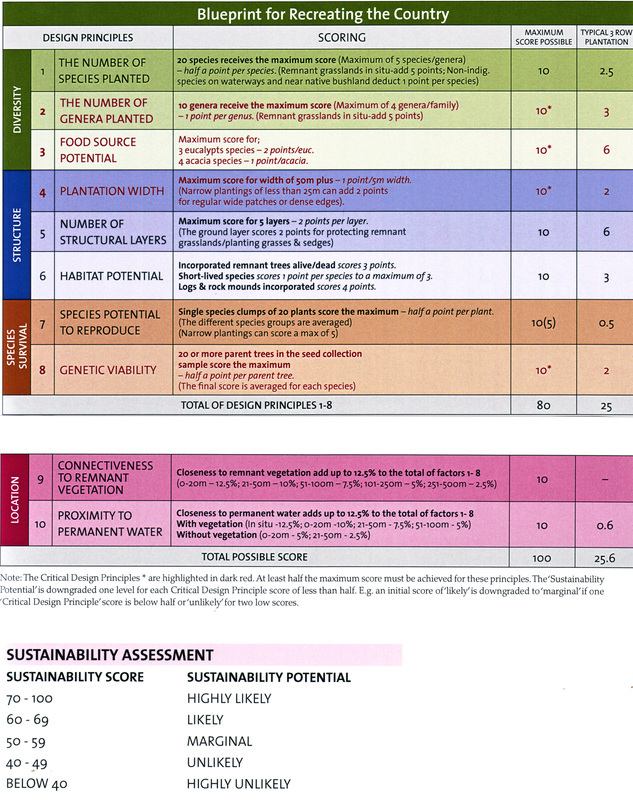 Also reproduced below is the original Sustainability Index devised over a 15 year period by Stephen, which was reproduced in the Australasian Plant Conservation article last year (Vol.21/2). See if you can spot the differences!